No one is too young or attractive to suffer from anxiety. Amber Smith is a beautiful 22-year-old, but just because she's attractive and young it doesn't mean that she doesn't suffer from anxiety. 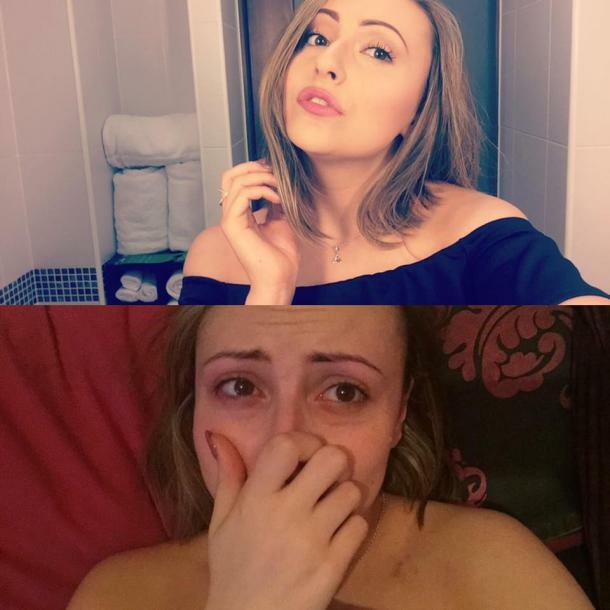 To highlight that point, she shared two photographs — one on top of the other — to show what she looked like before and after a panic attack. "Someone actually said this to me one day: 'Aren't you too young to be suffering with anxiety and depression? What do you actually have to be depressed about at your age?' Wow, just wow," Smith wrote on her Facebook post. Before the panic attack, she looked put-together; after and still dealing with the anxiety, she looked emotionally fraught. Smith wrote, "Top picture: What I showcase to the world via social media. Dressed up, makeup done, filters galore. The normal side to me. Bottom picture: Taken tonight after suffering from a panic attack because of my anxiety. Also, the normal side to me that most people don't see. F*ck all of you small-minded people that think that because I physically look 'fine' that I'm not battling a monster inside my head every single day." One out of 20 Americans older than 12 years old reported suffering from depression in 2005 and 2006. In England, where Smith lives, the numbers are just as high. "I'm so sick of the fact that it's 2016 and there is still so much stigma around mental health. It disgusts me that so many people are so uneducated and judgmental over the topic. They say that 1 in 3 people will suffer with a mental illness at some point in their life. 1 in 3! Do you know how many people that equates to worldwide? And yet I've been battling with anxiety and depression for years and years and there's still people that make comments like 'You'll get over it', 'You don't need tablets, just be happier', 'You're too young to suffer with that." Smith decided to write the post because she felt misunderstood by the people closest to her. Smith decided to share her pictures and talk about her anxiety disorder via social media. "I kind of reached a point where I recently wasn't feeling too good with everything and I got forced to go out with some friends," she told ABC News. "[My friends] kept saying, 'Why are you late for this? The whole time they didn't know that I've been at home feeling nauseous, panicky, feeling sick and just generally not in a good place." Regarding her choice to post publicly about her anxiety, she said, "To anyone who is going through the same, please do not suffer in silence. There is so much support around. Don't be scared to ask for help... Don't bully others, don't put others down, and the hardest one of them all (as we have all done it at some point) don't judge another person. We're all human regardless of age, race, religion wealth, job. So build one another up instead of breaking each other down." So far, Smith's post has had over 33,000 shares. "The messages that people are sending me are beautiful and they're so lovely — but that wasn't the reason I did this. I was sick of people suffering in silence. The most important thing for me to do is to use my voice so they don't have to feel like they're by themselves."